My Mum always said never judge a book by it’s cover but I imagine she didn’t have MAC Volcanic Ash Exfoliator in mind when she sprouted those words of wisdom. Have you seen this stuff? It’s disgusting. This stuff is absolutely rank. It’s a gooey mess of black sludge that will bring to mind the very worst budget horror films to the forefront of your feeble little brain. But, as with all things, it appears my Mum was somehow right when she gave me that Mr. Roger’s mentality speech about how something might look bad but that didn’t necessarily mean it was bad. 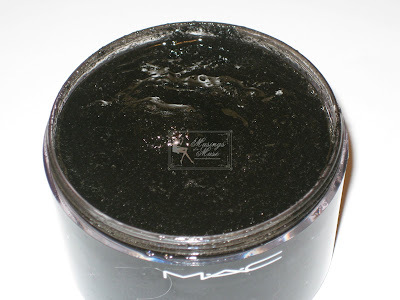 Even though MAC Volcanic Ash Exfoliator looks like it was scraped from the bottom of a rotting pile of garbage that does not account for it’s awesomeness. And boy oh boy is it awesome. So this here blends volcanic ash with sugar crystals and Bob’s your Uncle you have a face and body scrub! How’s that for cool? Now you can run around and tell your friends how your skincare sports volcanic ash in it! If that does not make you the coolest kid on the block all hope is lost people! It’s black, it’s gross, but turns out it smells heavenly. Go figure. The contradiction is too much to wrap my little mind around! I really love the smell! I can’t describe it too well but it’s half floral, half herbal, a bit foody and all good! The consistency is a cocktail of slippery and oily fun. It contains a healthy dose of sugar crystals to scrub the dead skin cells off your face, elbows, knees, and just about anywhere else you’re seeking smooth, gorgeous skin! I’ve only tried it on my face for the better part of the week and promptly made it my business to grab a second jar of it before it’s gone from the shelf for good. Dear MAC, many of us would appreciate it if this was added to the permanent catalog! Thanks so much! I can’t stop touching my face after I’ve used this. It feels so smooth and lovely! I’ve used this three times last week and I’ve noticed a vast improvement of the pesky blackheads that take up residence on the tip of my nose. A little goes a long way so the generous size jar should last you a few months especially considering you won’t be using it daily. $19 USD gets you a big old 4.5 oz/133 ml bucket of this stuff and I’m sad to report it’s completely sold out at MAC’s website but do check around other sites or head on in to your local store to nab it while the going is good. After three uses I noticed a vast improvement in my dry, oily weird-o combo skin I sport in the Summer. My skin is now beautifully smooth minus my dry, patchy cheeks and oily forehead! Thanks MAC! I happened to notice after use that my latest obsession, Urban Decay’s Surreal Skin Mineral Makeup, is applying way better than ever before! Good news for the mineral foundation users this will make a perfect prep scrub in the shower! This is easy enough to use and no prior brain surgery training is required. Wet your face, take a small amount of product and begin rubbing it on with gentle circular motions. As you rub you’ll notice the crystals begin to disappear and the scrub slowly foams up some. I keep scrubbing for about a minute or two and rinse with cold water. That’s it! Done! Beautiful skin all prepped and ready for your moisturizer and makeup! 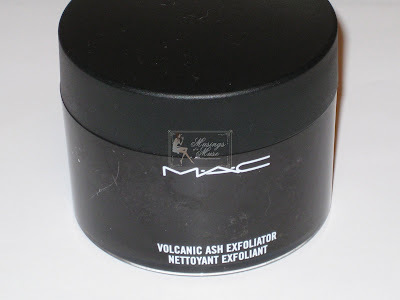 MAC Volcanic Ash Exfoliator is a winner for the Muse! I have two jars stocked in my washroom closet and I’m thinking I may need a few more if this won’t be making a reappearance anytime soon! This one gets a hearty Muse Approval for purchase! 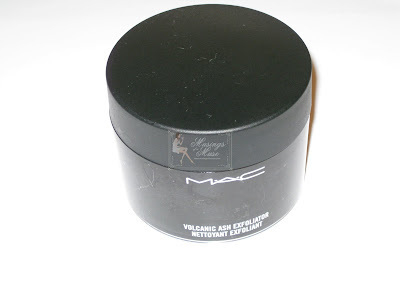 It took me a few but I finally firgured out what was niggling at the back of my head about MAC Volcanic Ash Exfoliator! It quite reminds me of Lush Coal Face! It smells similar and does pretty much the same thing coal face does aside from the fact it’s a liquid scrub and coal face is a solid form! So the good news is if you fail to find MAC Volcanic Ash Exfoliator at your local counter or freestanding you can head on over to Lush and grab yourself a chunk of coal face to comfort yourself with! Hey honey, it’s been long i know but i’ll soon be sending you an e-mail almost as long as an extended essay! I think i might have to stop my MAC to get this when i’m in Australia as i leave in 2 weeks and there’s no point now. Having said that, Lush’s version used to totally dry out my combo-oily skin so i don’t know. I also love this and I�m glad I snapped one up in time! 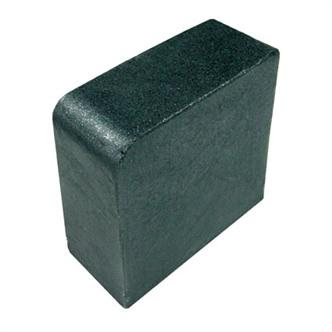 I also have the Lush coal soap, but I’m still finishing Fresh Farmacy that seems to last forever! Nice to see you me love 😉 OOOO my I’m eagerly awaiting said email! I owe you a few I’m sure 🙁 Just been busy! Plus needed to do your FOTD guest post! I’m slow can you tell!? So you’re officially moved soon eh? I’d missed you before but now you’ll be even further away so I’ll miss you double much hehehe! The texture are a slight difference as the mac version has crystals and is scrubbier if that makes sense where as the coal face version as very tiny pieces of coal and doesn’t have that much “scrub” in it so to speak! I’d say coal face was gentler. The mac version feels a bit more emoilent as well considering it contains oil and coal face doesn’t. Mandy I have a brand new tube want me to send you a sample from it? Def smell it! I really dig the smell 🙂 It’s worth picking up IMHO as it’s a damn fine product. I don’t normally like mac skincare line but this is a winner for me! I normally slice pieces from a 3.5oz bar and use them like that which makes it seem like it lasts even longer than normal! 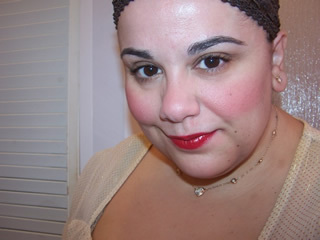 I was so lucky to get a MAC volcanic ash after calling 6 stores near my vacinity. Got the last one left at the 6th store. I have a feeling if they bring it back on at a later time the price is gonna be jacked up. Anyways I’m not quite sure I can say Coal face and volcanic ash are similar. For me they are just way too different for their purposes and performance. Nope it just won’t replace my MAC volcanic ash. whoa! Where do you live? I got lucky at the 2nd store I called. I wanted a back up after getting my first jar and called my counter but it was gone so I called the store and got one right away thankfully. I def say that mac’s scrub gets props for being a better scrub however if you can’t find it anywhere coal face isn’t too bad a replacement. I’ve heard good things about this product too, but it’s not available here. I’m thinking about having my friends in the US pick up a tub and post it out to me. Is it big/heavy? It’s worth grabbing as it’s quite good however it is somewhat heavy. Should cost about $8 USD or a bit more to ship I’d say. It looks absolutely awful but it does actually work. I’m not a huge fan of mac skincare but this is a winner. Def worth checking out lovie! what are the ingredients in the volcanic ash pdt? hi jnie 😉 How are you gorgeous? Oh gosh I’m with you! and post back what I find! Hey Muse, we still aren’t getting this in SG. Hopefully, it’ll come in soon! Can’t wait to try it out after reading your review. I think you’ll sincerely like this one. It’s a very interesting scrub. If you suffer from oily skin it’ll be a god sent as I felt like it made my skin quite matte after use while scrubbing away any flakey bits too! I’m sure it’ll pop up soon! Is cool heat making an appearance yet?